The American Petroleum Institute (API) on Tuesday announced a new initiative aimed to further bolster already successful voluntary efforts to reduce emissions of methane and associated volatile organic compounds from oil and natural gas systems. Featuring 26 companies that represent operations in every major U.S. oil and natural gas basin, the “Environmental Partnership” initiative consists of programs designed to monitor and fix leaks, replace and upgrade pneumatic controllers, and minimize emissions associated with separating liquids that can build up and restrict natural gas flow as a well ages. The initiative will start at the beginning of the new year, and will apply to new and existing sites. Annual emissions reporting from participating companies will also be made available to the public. But this assessment is far from accurate, as data point after data point demonstrate the industry’s continued efforts to voluntarily reduce emissions have proven highly effective, period. The Sierra Club’s willful dismissal of this fact further illustrates that its “Beyond Dirty Fuels” campaign has nothing to do with methane reductions — it’s all about imposing as many regulatory hurdles as possible. 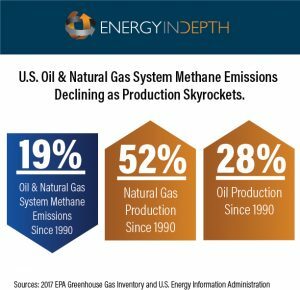 The most recent EPA Greenhouse Gas Inventory shows that oil and natural gas system methane emissions have declined 19 percent since 1990 at the same time natural gas production has increased 51 percent and oil production has increased 28 percent. The latest EPA data show the oil and natural gas industry has continued to reduce methane emissions even as the shale revolution has sent oil and natural gas production skyrocketing. Oil and natural gas system methane emissions have declined just under two percent since 2005 at the same time oil and natural gas production increased 71 and 47 percent, respectively. The latest EPA Greenhouse Gas Reporting Program data tracking emissions from larger oil and gas facilities shows methane emissions declined by nearly 14 million metric tons between 2011 and 2016. Reductions have been seen in virtually every major oil- and gas-producing basin, including the San Juan Basin (down 47 percent), Appalachian Basin (down 24 percent), Permian Basin (down 6.3 percent), Williston Basin (down 8.3 percent) and Anadarko Basin (down 34 percent). The American Gas Association also recently noted that the amount of methane emissions per unit of natural gas produced has declined 46 percent since 1990. Skeptics have questioned the accuracy of the EPA data, suggesting the agency has underestimated emissions. But a recent peer-reviewed National Oceanic and Atmospheric Administration (NOAA) study suggests the opposite may be true. That study found emission estimates reported in a series of studies used to justify federal methane regulations may have been significantly exaggerated. These studies — long used to support the “super emitter” theory — were conducted during episodic events, which skewed emissions higher than they typically would be, casting doubt on their conclusions. As a result, these “peak” emission data were inappropriately used to calculate a normal emissions profile by the EPA in its most recent Greenhouse Gas Inventory. In other words, official regulatory inventories are likely overestimated rather than underestimated, as groups like the Environmental Defense Fund (EDF) have repeatedly claimed. 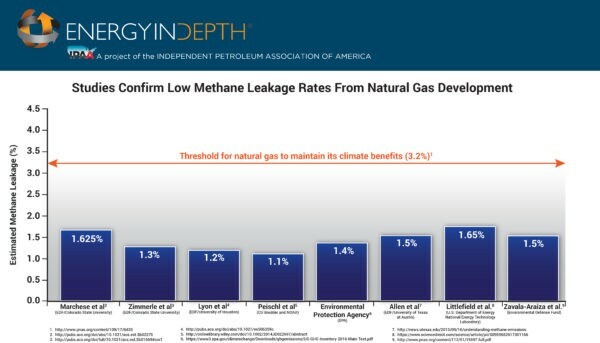 Numerous studies — including several by EDF — confirm that current leakage rates are far below the 3.2 percent threshold for natural gas to maintain its climate benefits. The prevailing scientific data really couldn’t be clearer: Not only is the United States leading the world in oil and gas production and carbon dioxide reductions — all thanks to fracking — it is also setting the tone with regard to methane reductions from oil and gas development. A recent International Energy Agency report noted that U.S. oil and gas system methane emissions represent just 10.5 percent of the world’s total oil and gas methane emissions, even though we are the largest oil and natural gas producer in the world. Again, these methane emissions reduction trends can be traced to voluntary efforts — not the stringent and costly “one-size-fits-all” federal rules that environmental groups insist are needed, despite the fact that they will provide little climate benefit. And that said, it is clear that these groups are more interested in implementing as many regulations as possible rather than reducing greenhouse gas emissions. Fortunately, while these groups are off talking about what the industry should do, the oil and gas industry will continue to voluntarily improve its environmental footprint – far ahead of being told to do so.